INDUSTRY.co.id - In the 2018 Mobile World Congress event, in Barcelona, ​​Spain on February 27th, in addition to introducing the 5th Generation ZenFone lineup, Asus also showcased the latest ZenFone Max (M1) smartphone and Asus NovaGo laptop that can always connect in the demo area. Information obtained INDUSTRY.co.id, Friday (2/3/2018) says, ZenFone Max (M1) is the latest model in the ZenFone Max Series and is the only series of high capacity smartphone batteries in the world. ZenFone Max has a full view of 5.5 inches in a very compact body that is no bigger than a standard 5-inch smartphone, but comes with a 4000mAh high-capacity battery. With an expanded display area, compact size, dual rear camera with 120 ° wide angle lens, and an easy fingerprint-based locking system, ZenFone Max offers a combination of class features designed to accompany all life's adventures. ZenFone Max has the stamina to travel, and lets photo lovers view larger images with wider creative options - all packed in a stylish, ergonomic and comfortable metallic design to hold. Meanwhile, NovaGo is the world's first Gigabit LTE laptop designed for truly connected mobility, giving users can always-on, always-connected experience. The ultrathin laptop and lightweight convertible is powered by Snapdragon 835 Mobile PC Platform, and comes with a Snapdragon X16 Gigabit LTE modem for download speeds up to 3-7 times faster than the average broadband speed as well as having 2x2 11ac Wi-Fi and integrated Bluetooth 5. This gadget has a 22-hour battery life with a modern standby of more than 30 days, and a built-in eSIM that ensures seamless connectivity across borders. The fast charging function gives No vaM durability of up to five hours with a charging time of only 15 minutes. 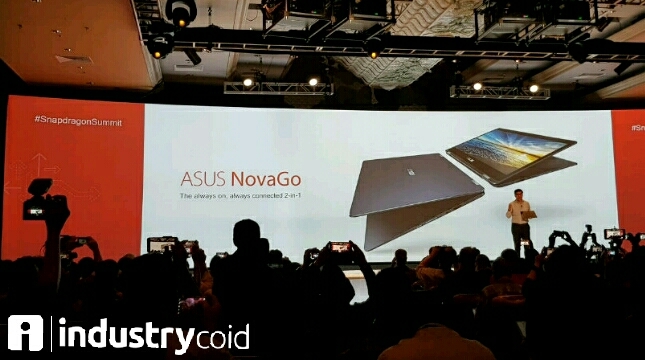 NovaGo is a new type of laptop designed for users who understand the ever-connected technology, and always connect the possibilities and provide a familiar Windows experience plus all the new features like Windows Ink, Windows Hello and Cortana with very fast connectivity and power efficiency on-the- go is amazing.